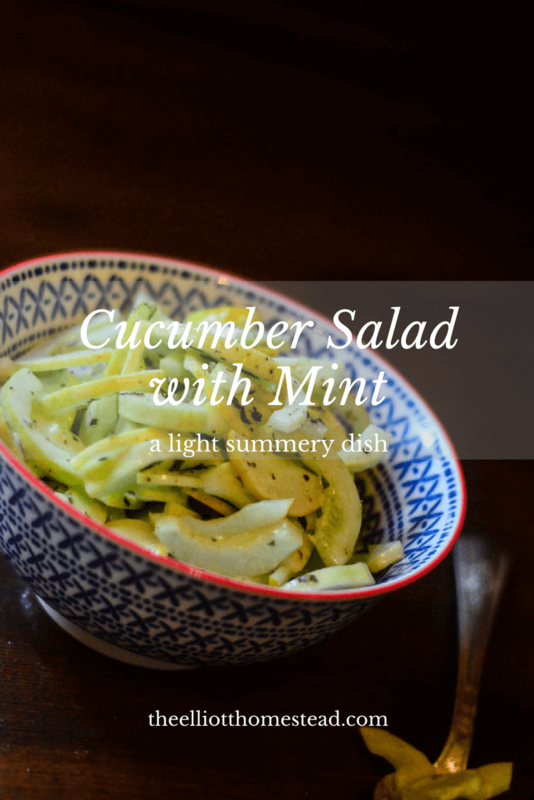 This summer, we’ve been eating lots of delicious Cucumber Salad with Mint. It amazes me as a gardener how one year a particular crop can be right-on-the-money, only to be followed by a disastrous showing the following season. Last summer, I was able to put up a years supply of onions, braided lovingly in my laundry room, for all the world to see. This year, my measly onions took months to germinate and when they finally did, were quite pitiful indeed. Even more pitiful than my onions were the fact that my new barn cats dug the few small onions up that had survived. Whatever, onions. Whatever, cats. Get over yourself. On the contrary to my pathetic onions, this year, my cucumbers have really flourished! Which is a good trade-up from last year’s harvest, which included all of a dozen small cucumbers who’s bitter taste was less-than-desirable. Whatever, last year’s cucumbers. Get over yourself. 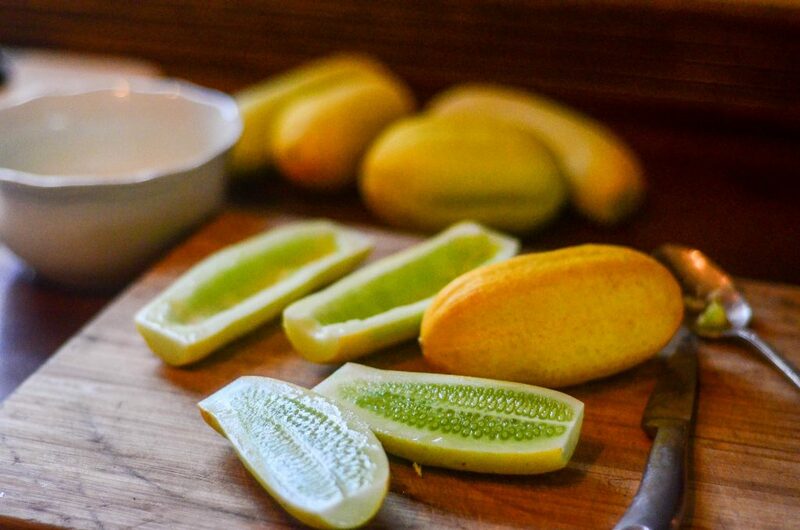 This year’s cucumbers, however, are the specimens that cucumber dreams are made of. Prolific, sweet, and moist. And did I mention prolific? That means my harvest basket is always full of them. That means there’s lot of them. That means that we’ve been eating them by the truck load. And that means I need more cucumber recipes in my repertoire. Oh, hello Cucumber Salad with Mint. Welcome to the party! And speaking of parties, have you checked out Meal Plans yet? It’s a planning party for Mamas everywhere! 1. Cut the cucumbers in half lengthwise. Use a spoon to scoop out the seedy middle. This is, of course, an optional step but by removing the seeds, we’re not only improving the texture of the salad, but we’re also taking a lot of the liquid out so that it doesn’t become cucumber soup. I don’t bother peeling my cucumbers because they have a very crispy and thin flesh, but if yours are thick or bitter, feel free to peel the cucumbers. You’re free. I give you permission. Peel and scoop away. 3. In a small bowl, whisk together the lemon juice, cream, and olive oil. Drizzle this over the cucumbers. Salt and pepper to taste. 4. Allow the cucumbers to marinade in the dressing for a bit. It gives the flavors time to marry. And married flavors are tasty flavors. 5. Before serving, add in the minced mint leaves, and gently toss. 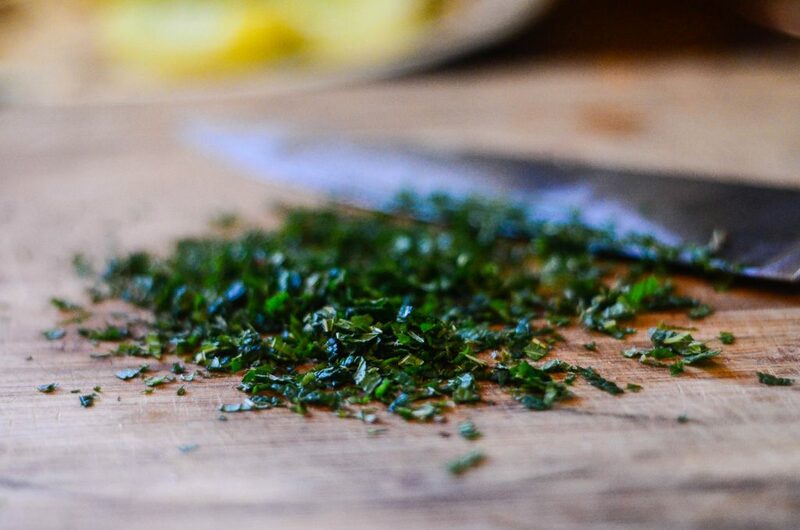 Add an extra grinding or two of fresh pepper – because it looks pretty, that’s why. So do it! Sorry. I don’t mean to be bossy. But I like pretty dishes. 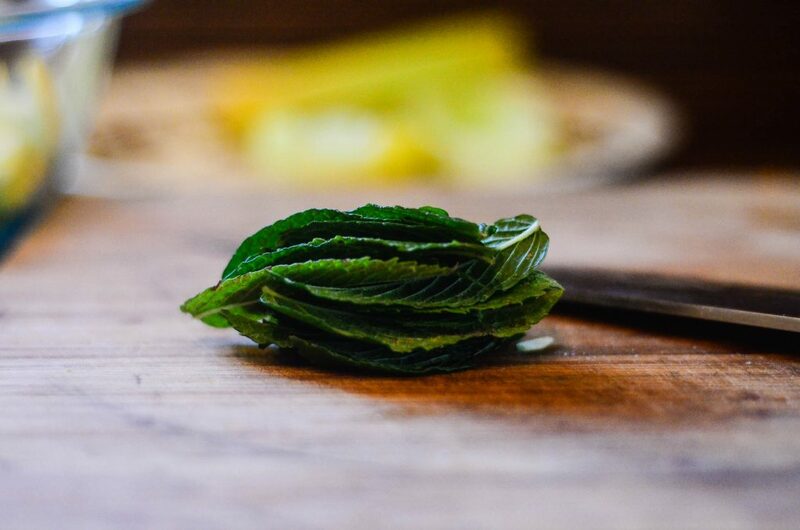 Which is part of the reason I love this easy salad – the little flecks of bright green mint totally make me swoon. Couple that with the fact that it’s a summer salad not dressed in mayonnaise (as so many of them are), it uses up extra cucumbers for the garden, is great on it’s own or on top of meat or sandwiches, and comes together in a few minutes, I’d say it’s a win. 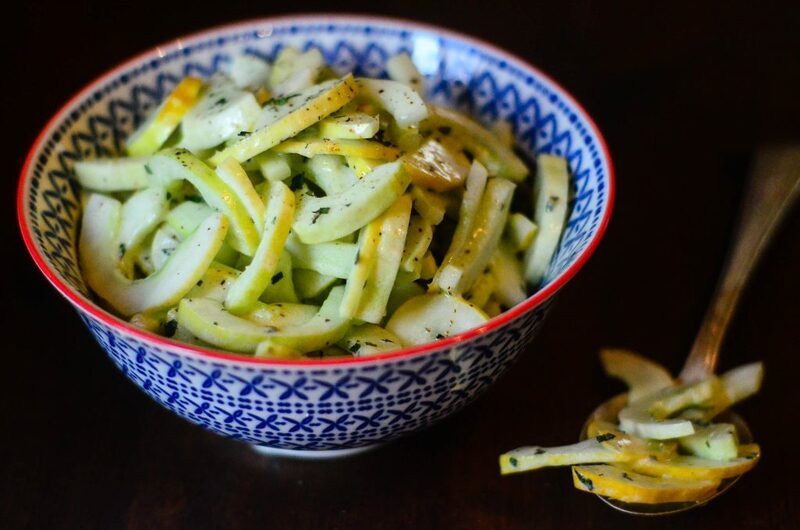 Cucumber salad with mint for the win! 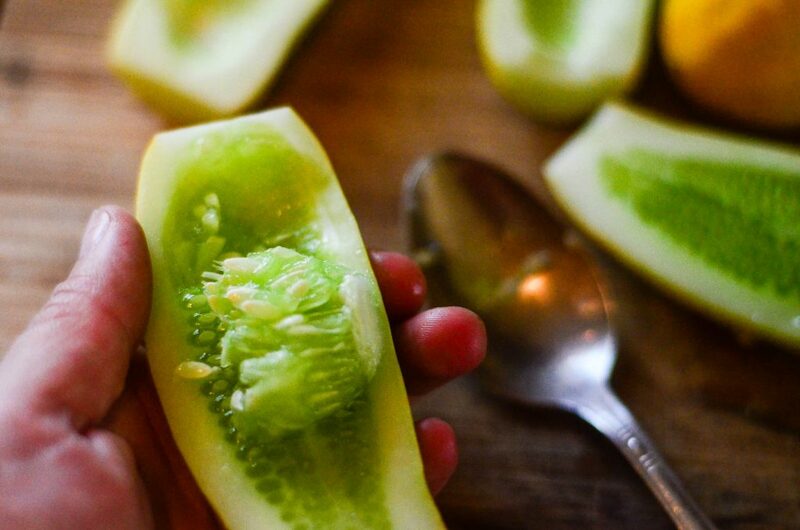 If cucumbers aren’t prolific this time of year in your garden, check out your local Farmer’s Market! There’s bound to be a grower or two near you. Support them – put money into their pockets so they can continue to farm and bring the world great produce. Scratch that. I don’t just think it’s important, it IS important. 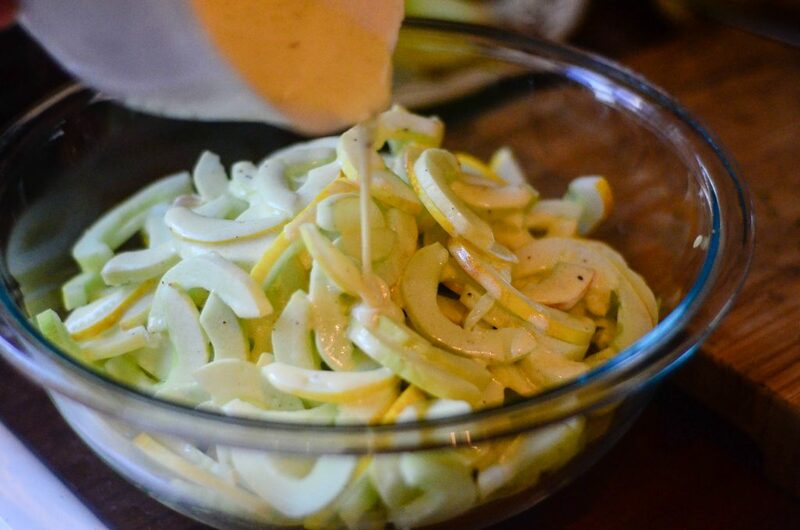 As is the fact that you need to make this cucumber salad. 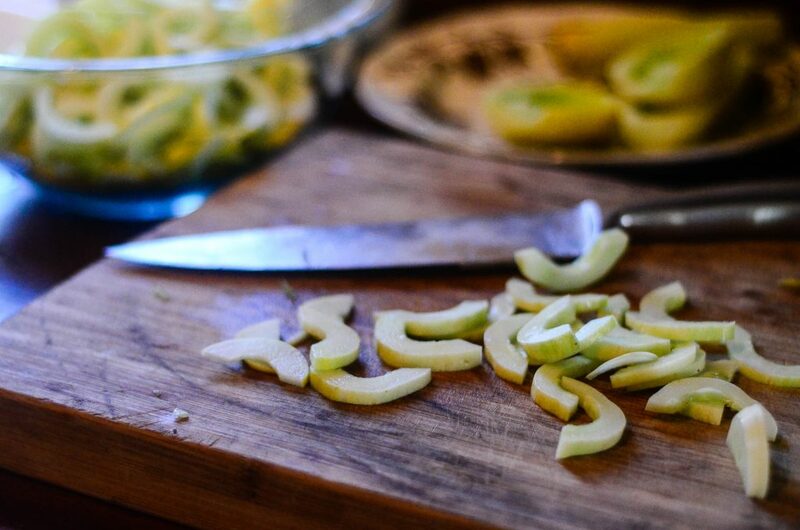 Cut the cucumbers in half lengthwise. Use a spoon to scoop out the seedy middle. This is, of course, an optional step but by removing the seeds, we’re not only improving the texture of the salad, but we’re also taking a lot of the liquid out so that it doesn’t become cucumber soup. 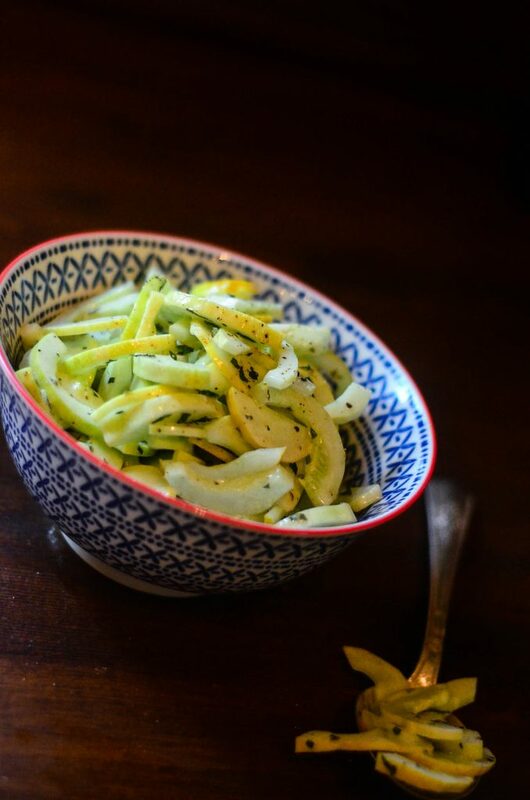 Cut the cucumbers into thin slices and place into a serving bowl. In a small bowl, whisk together the lemon juice, cream, and olive oil. Drizzle this over the cucumbers. Salt and pepper to taste. 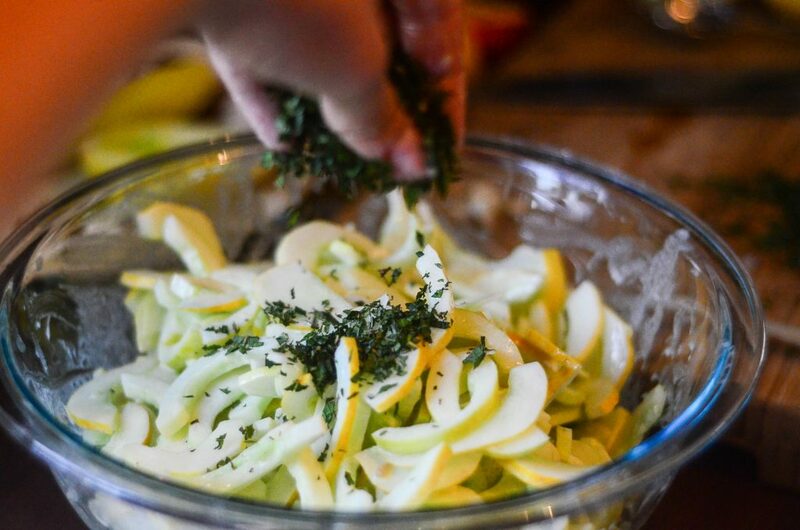 Allow the cucumbers to marinade in the dressing for a bit. It gives the flavors time to marry. And married flavors are tasty flavors. Before serving, add in the minced mint leaves, and gently toss. Add an extra grinding or two of fresh pepper – because it looks pretty, that’s why. So do it! ahaaaaaaaaaa I like the PRETTY DISHES thing too-beautiful BOWL. and your comments about good crop/bad crop year for different vegetables [or herbs] simply reminds me of what my GOURD FRIEND, Hattie in Texas always said when an herb, gourds, loofas, sunflowers, whatever didn’t produce well or ever worse did not GET PLANTED this year. Hattie always said: “Oh well, NEXT YEAR.” I CLAIM THAT. sounds like your attitude..whatever comes in a great harvest you make us of it..AND you are so on target….there is a way to use everything..the cut off ends, throwaway peels and seeds. Again, Hattie always told me” Do not throw a way any part of the gourd you cut out…there’s something you can make w/ it. SO TRUE..the neck of a gourd now hangs upside down on my bedroom door to hold dried flowers/or flowers as they dry. Same thing you are doing with the seeds . isn’t THIS LIFE f u n!!!! 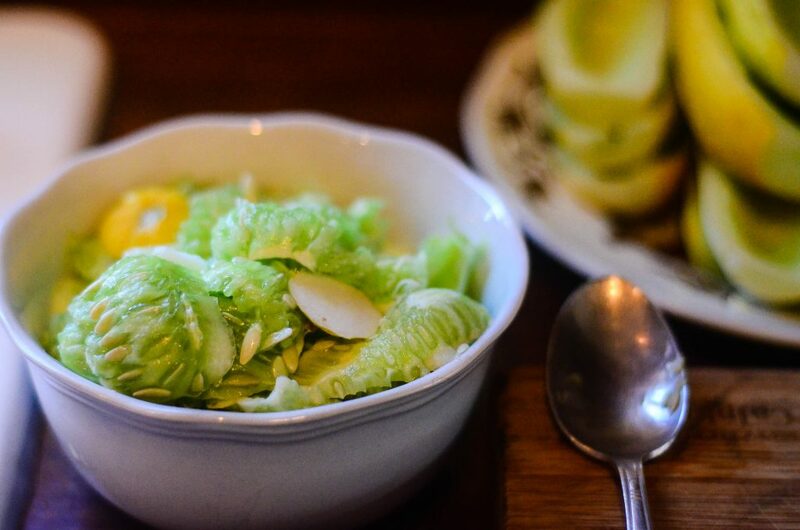 I am planning my Spring/Summer garden now, I will be planting lots of cucumber so that I can make this salad! thanks. Ohhhhhhhh! This sounds SO yummy! And I love love LOVE cucumbers. As I am not in cucumber abundance, I’ll be hittin’ the Farmer’s Market tomorrow. As for onions: I’ve got THOSE coming out of my ears! We even left some of them to sprout…with those groovy, weird looking balls at the end of very long stems. They look like something from another planet (grin). Thanks for this recipe, Shaye. And ALL the other great stuff you share with us here. You ROCK! This looks yummy! 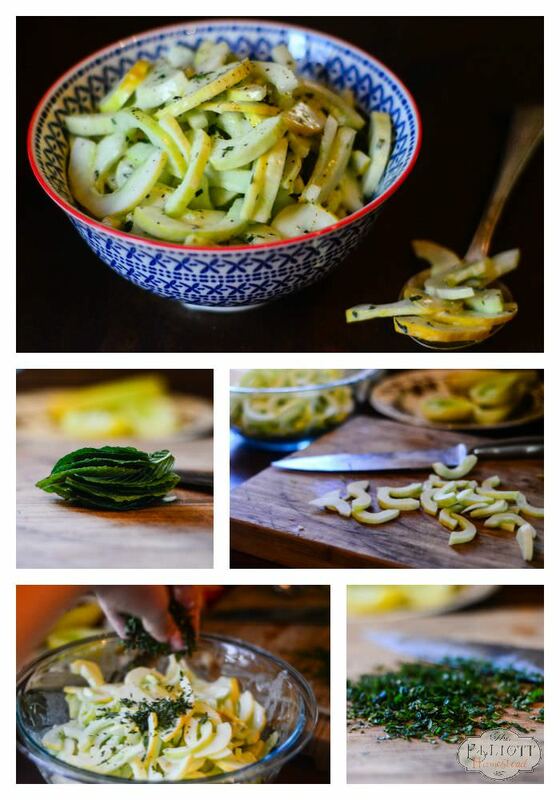 I have a cucumber recipe to share with you for your abundance of cucumbers 🙂 My hubby copied it from one of our favorite sushi restaurants so its an asian cucumber salad. Sorry, I don’t have specific amounts. He just kind of throws it together. Put it in the fridge to chill and your done. Then sit down and eat it with a Sapporo. On the porch if you want. Unless your flies are out of control like ours. Then by all means, go inside. Those little buggers have been on every kind of poop know to man! You don’t want them pooping up your cucumber salad! Cucs!!!! Enough soy sauce to coat all the cucs for heavens sake! Not cuds! Stupid spell check! I know what I’m trying to type! Ohhh, sounds awesome. My favorite this year is cold cuc soup woth avocados lime and a titch of maple syrup. when a reciepe calls for mint what kind spearmint or peppermint i have always wondered about it. thanks in advance.